Earlier this year we asked our readers what they think future flashguns should be like. Eight months and 264 votes later, the results are in. 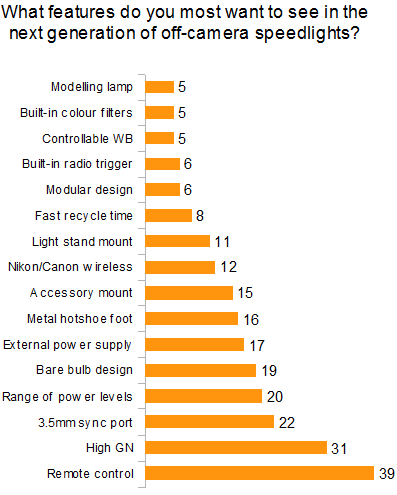 The most popular feature by a clear margin is remote control of the flashgun’s power levels from the camera. However, wireless TTL, or compatibility with Nikon and Canon’s existing infrared wireless systems, is not as desirable. The implication, then, is that photographers want to see some sort of new wireless system without the same limitations as Nikon AWL. But only 6 voters specifically demanded a built-in radio trigger. The second most sought-after feature is a high maximum flash intensity, with some respondents even specifying exact numbers such as “150Ws”. For comparison, today’s conventional system flashes store only around 50-60Ws of energy. The recently-released Falcon Eyes SG-100 has 100Ws. In line with David Hobby’s criticism of the Prontor/Compur (PC) connector, a large number of readers want 3.5mm jacks to replace PC ports. Other popular features include a bare-bulb design, support for an external power supply and fine adjustment of manual power levels. Interestingly, not one person voted for TTL as a feature in our survey.